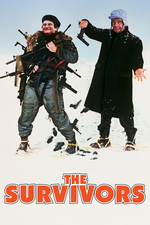 Robin Williams and Walter Matthau team up and arm themselves to the teeth in The Survivors. Part of the Robin Williams Movie Club Series. I haven't watched this movie in years but it is frighteningly prescient in a way. The conditioning scene (gun or pancakes) is fantastic. Just watched it and it exceeded my expectations. The conditioning scene - yes, that is a great scene and it gives both actors stuff to do. The rest of the script is just so-so - to my mind I think this is what's called "elevating the material": Robin Williams is elevating the material through his comedic delivery of the lines, and physical stuff. I've never clicked with Matthau - he's not my cup of tea and I think he gets by on one thing: his hangdog expression. However, he does play a likable character and is the voice of reason in the film. Plus, thank God for this speech which I think is just one of the best "come to your senses" anti-survivalist (and anti-gun) speeches in a movie ever (when he comes out of the cabin waving a white hanky and starts, "Whattsamatta with you people?"). He seems to work well with Williams. This script is very much about this cultural moment in America, when the country was feeling run down and Ronald Reagan was early in his presidency, promising a new vision for America. Things were generally felt to be going to hell in a handbasket and the movie references this several times. ("Name one thing that has gotten better in the last ten years." *stumped* "Video games!" "Yeah, okay, video games, I'll give you that..." :D) First Blood had come out in 1982 and was a huge sensation: machismo was fully embraced, and coming out of the '70s a lot of people thought this was a step backwards and, frankly, crazy. Williams' character dresses in a parody of this and allows the audience to vent criticism of the zeitgeist. -- "What war? The big one.... Korea." "Well it was big to me." -- "Dammit! I'm not going to see this man dangle for your delight!" Also, 1983 is an interesting moment in each lead actor's career: Williams was on the rise, and being in a film with a Hollywood legend conferred respectability on him. For Matthau, who was losing his cultural relevancy fast, being in a movie with Williams injected some edge to his career. Williams strips bare at the end of this movie, as he does in World's Greatest Dad, which I just watched yesterday. Kind of a curious coincidence. An interesting snapshot of a different America. Forgot to mention: that is a very young John Goodman that is one of the gun sellers at the gun/survivalist convention early on in the movie. He's only on the screen for about 3 seconds but his voice is very distinctive.